Accessory Insanity Mobile Fashion Truck can host a variety of functions from Charity Functions and Team/Office Fundraisers to Inter-Office Lunch Hour Shopping Sprees and Home Parties. We also welcome Cross Promoting with other businesses and organizations such as lounges, restaurants, salons/spas and other specialty shops. Or maybe you are organizing a Pop-up Shopping Event in your community. Yes, we do those too. If you are interested in booking our Mobile Fashion Truck for your office party, fundraiser, charity event or pop-up shop ... please feel free to contact us. We will be happy to answer all your questions. Or read on below for a detailed outline of our Hostess Rewards. $0-$750 - You earn 20% of total sales (before tax) = up to $150 in FREE product! $751-$1500 - You earn 22% of total sales (before tax) = between $165 - $330 in FREE product! $1501 or more - You earn 25% of total sales (before tax) = $375 & beyond in FREE product!! Lunch hour shopping at your place of work - Gather the crew and arrange a lunch hour shopping extravaganza. "Cut out early" - Organize a shopping party near the end of a long work day. Meet in the parking lot for quick break before you head home. Pre-Bachelorette Party Shopping Spree - Who doesn't love a bachelorette shopping party? Changing of the Seasons - Bring in your old purses, wallet, jewellery & accessories. We will donate them to a women's shelter and you will receive 10% off your purchase that day. Pamper Party - Coordinate with your hair salon or spa for a collaboration shopping/pampering experience. "School's out for Summer" - End of the school year, teachers and staff shopping celebration. Mother's Day - Have a lot of Mom's working at the office? Show your appreciation by booking the truck for a special Mother's Day shopping extravaganza. Give her the freedom to relax and enjoy a quiet shopping experience without the kidlets in tow. Guy's Gift Buying Event - Have quite a few men at work with ladies in their lives to shop for? Want to avoid the frantic shopping malls? Book the truck and we will bring the store to you. At work. Loads of fabulous gifts for the wife, girlfriend, daughter, sister, Mom ... even a few items for yourself. Christmas Gifts - Get the whole office together for a shopping spree over your lunch hour. Avoid the busy malls and have fantastic, inexpensive gifts brought right to you. High School Team/Club Fundraisers - need new jerseys, planning a team trip or tournament, new band equiipment, uniforms ..
Raising Money for a Local Family or Charity in need. Raise funds for your next company function. Raise Funds and Awareness for a local or even global cause. 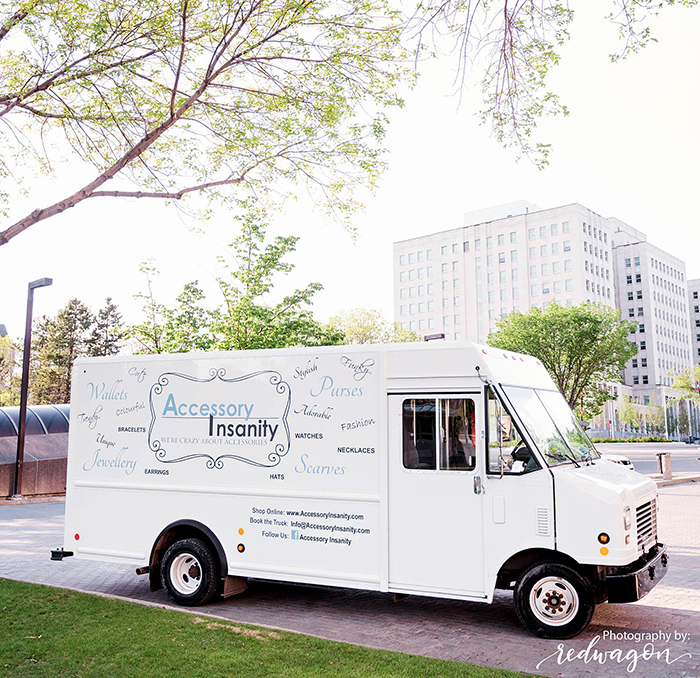 The Accessory Insanity Mobile Fashion Truck is ready to bring the latest in unique gifts to you. Fabulous purses, adorable wallets, funky jewellery and fantastic accessories at your office, fundraiser, charity event. Nothing could be more convenient. Contact us today, to get the truck rolling. Company Annual Golf Tournament - We set up in the parking lot and donate a portion of our total sales to your charity. Raising Awareness Charity Events - run it by us. We may be interested in getting involved with your event. Pamper Party - Coordinate with your hair salon or spa for a collaboration shopping/pampering and charity support. Local Charity Event already in the planning? - We set up in the parking lot of your event and add to your total $ collected. Lunch hour shopping at your place of work - Gather the crew and arrange a lunch hour shopping extravaganza with a portion of the total sales to be donated to your company sponsored charity. If you are interested in booking our Mobile Fashion Truck for your office party, fundraiser, charity event or pop-up shop ... please contact us. 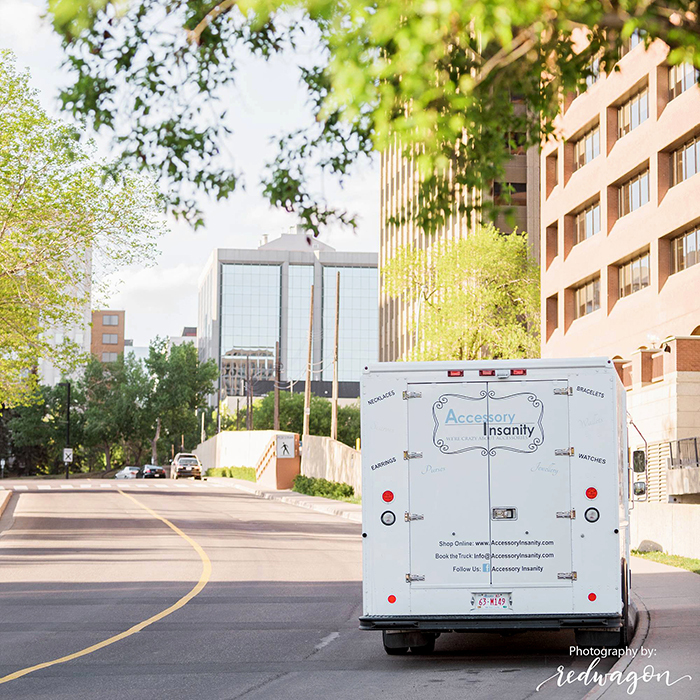 The Accessory Insanity Mobile Fashion Truck will arrive approximately 45 min before your event is scheduled to start, to ensure set up is complete. We require a designated parking space to park and set up. Typically a driveway, parking space or open flat area. The truck is approximately 22 feet long and 10 feet wide. You will need to have at least 15 confirmed co-workers/guests (if it is an office party or home party). We accept Visa, Mastercard, Amex and cash. Typically, most of our items range between about $20-50. With nothing over $80. All rewards/credits to the host/hostess will be as per prior agreement. We will pack up, clean up and leave the premises as it was prior to our arrival, when we are done. You don't have to worry about a thing. Just relax and enjoy the shopping experience. Nothing could be more convenient. Contact us today, to get the truck rolling.